I’m doing NaNoWriMo! You probably already gathered that from the image and the title of this post. But I wanted to say it again. I know it’s halfway through the month, don’t worry, I did start on the first. This is why I haven’t posted much recently because if I have free time, I’m writing. 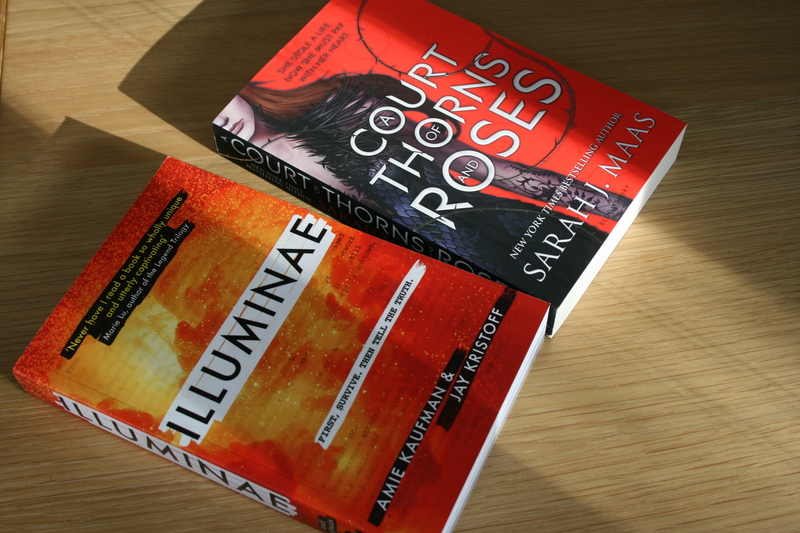 Reading has also become a thing of the past (for this month anyway) and I do want to say that I will get around to reading the two books I have for review out this month as soon as I can get into reading. I cannot get into reading any books at the moment, which is disheartening. But at least it means more time writing. Although I would love to achieve it, I’m not looking to write a 50,000 word novel, as that quite honestly, is unrealistic. My first goal was to write more than I did last year (not difficult considering I only wrote 14,341 words) and I achieved that in the early hours of this morning (why are my most productive times between the hours of 11pm and 1am?). So that’s made me very happy. This is my final year of school, and so obviously the workload is massive as it’s the year of the A levels. AS levels are done (thankfully I passed with high grades – somehow) and now I have to put a load of energy into getting equally good grades in the other half. However the other day I received an unconditional offer from my favourite uni (well, it’s only unconditional if it’s my firm choice – but that’s obviously going to be the case since it’s my favourite uni!) and I feel like I’ve been floating with happiness since. Yes, I’m weird. But can you blame me? I’m going to uni next year. My whole life has led to this (honestly uni has been my goal in life – I’ve always been desperate to go!). Needless to say, the fact that I have a place for certain takes the pressure off me a lot and means that I’m letting myself prioritise writing a bit more (especially since my course is English Lit and Creative Writing). I’m hoping to write at least 25,000 words this year, if not more (because I’ve planned for more). The difference between this year and last year is definitely planning. I had no idea how to continue last year with my story, yet so far I’ve planned for at least 42,500 words (I’m working on approximately 2,500 words per chapter basically) and I have ideas for how to continue after that. Whilst I don’t know exactly how it’s going to end, I’m sure I’ll work it out along the way and I have plenty of time before I’ll get to the stage where I’ll be writing it. Is anyone else doing NaNoWriMo? I know it’s extremely popular amongst authors and I do think that it’s been amazing for me and my confidence with my writing because I hadn’t written much prose for ages. I didn’t think I’d be doing it this year as I had no ideas whatsoever but now I’m 15,000 words in. Not many for some, but a great achievement for me, and I have the rest of the month to go. If you want to add me on NaNoWriMo then my username is NatalieLC! I read a total of 5 books this month, so definitely not as many as I wanted to get to *sighs sadly*. This was mainly because Lady Chatterley’s Lover took me 10 days to read as I really struggled to enjoy it and so it took me longer than a book that I enjoyed would have. But that’s the end of my reading for school (for now) so hopefully I can read more enjoyable books soon! This graphic novel is out next month and there will be a review coming soon, but I absolutely loved what this book stood for. It was a collection of people’s experiences about abuse and harassment, created in order to show to other victims that they are not alone. I think things like this are so important and so that’s why it’s in my favourites this month! I read this as an ebook, hence why it’s not in the picture. Well, I still don’t know what actually went on in this book, but I do know that it was so good. It’s the first Patrick Ness book that I have read and I was not disappointed, despite the hype because it was amazing. Everything was so abstract and ambiguous and this is like nothing that I’ve ever read. This book. If you haven’t already read The Queen of the Tearling then you really need to because these books are utterly fantastic. I can’t wait for the next one, even though it’s next year when it will arrive. 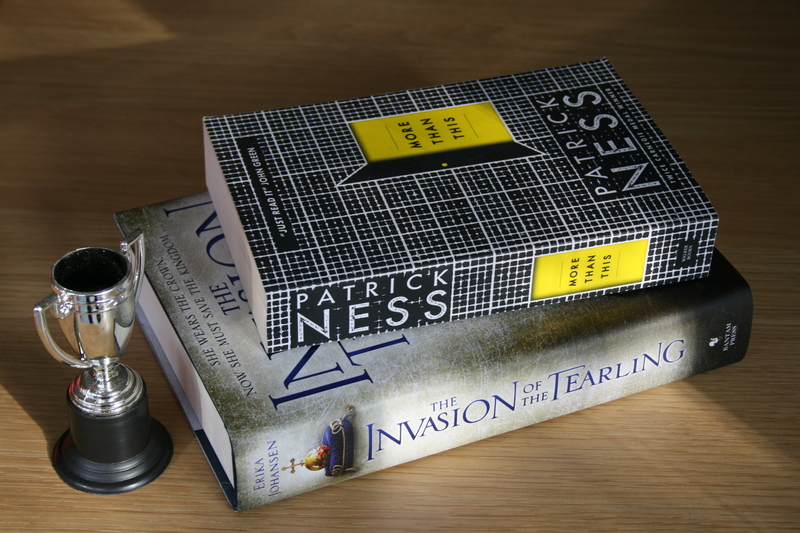 The Invasion of the Tearling is the sequel to The Queen of the Tearling and the second of the trilogy (I believe it’s a trilogy) and it is easily one of my favourites now. This book has such a good concept, and although it’s exaggerated I do believe that it represents the threat that technology presents extremely accurately. Worryingly, I don’t think it’s unrealistic to think that the very basic idea of the website Need created in this book could one day be a reality. I honestly hope not. The plot was so interesting, and so many things happened. Although it was fast paced I never really got confused with the events and what was actually occurring, although I did find myself getting confused about who was involved with what – I’ll move onto that later. So many unexpected things happened and I read this so quickly, desperate to find out what would follow. I loved the way that the plot took turns that were completely unexpected and it was such a good read because of this. I’m not normally a fan of thrillers, I have to say, and I only read the ones that really grab my attention so the fact that I enjoyed this shows that it was good. It totally gripped me and I could not put it down once I’d gotten into it. There was one thing that really frustrated me with this book though, and that was the multiple viewpoints. Now I’m normally a fan of more than one perspective, as it gives more information and other ideas, especially necessary in a book like this. But I just got so confused with them in Need. There were far too many narrators and the only one I could really get into and enjoy was Kaylee, who featured more than the others (which makes sense eventually) and is written in first person. I’m not talking about two or three viewpoints, I mean there were ten and I literally just got to the point where I couldn’t remember who a certain character was and what his backstory / reasons were and I feel like I lost some of the story there. It was great to get more insight and be able to make links between everything that happens but I found I would have to flick back to remember things in order to make these links. Kaylee was a character I liked, although she could be annoying! But I found that I could relate to her in some ways and at the end of the day it was easier to sympathise with her because she was realistic. She just wants to do the right thing, but sometimes she ends up doing the exact opposite without meaning to. I think that makes people human – everybody has tried to do something good but had the opposite effect. So yeah, I liked Kaylee, though I can completely understand why people don’t like her as she can come across as slightly irritating and persistent. I did love the way that all of the stories were connected in some way or another. I loved how the chain of events lead from one thing to another all because of greed, it really said something about how humanity is primarily selfish and driven by their greed, doing anything in order to get what they want. People didn’t consider the consequences of their actions until it was too late and I do think that’s true of the majority of society. I would definitely recommend this book as it highlights an important issue in society. It shows how even those who don’t particularly want to be a part of something still get dragged in and that social media can have a disastrous effect. I thoroughly enjoyed this book and I look forward to picking up more by the author, as this was the first that I have read of hers. Well seeing as last month’s TBR went awfully (but I did read some good books and complete my Goodreads challenge) This month is going to be very short to the books that I need to read and review! 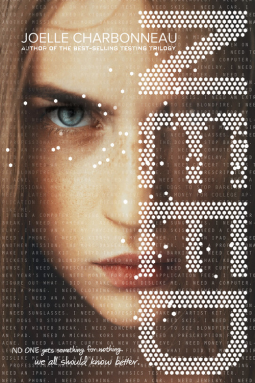 Need – Joelle Charbonneau – I have started this and despite being apprehensive at first I am really enjoying it. The Light That Gets Lost – Natasha Carthew – This is the one I’m most excited to get to because honestly this looks fantastic. Boy 23 – Jim Carrington – This also looks intriguing and I’m looking forward to getting to this one as well.